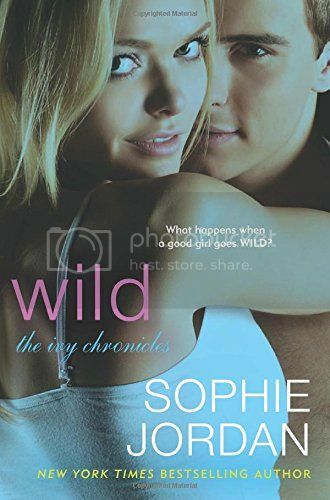 I absolutely could not wait to get my hands on Sophie Jordan’s Wild, the third and final installment in The Ivy Chronicles series. I adored Foreplay, and Tease was great also, so I just knew that I was going to love this story. And I did, SO much. I am a romantic at heart. I can’t help myself, I adore a good love story, and that is definitely what you get when you pick up this series. Wild is told from Georgia’s point of view, who we have met in the previous books. I didn’t really know what to expect from Georgia. While we’ve known her from the previous books, we still don’t know much about her. Her life is pretty much controlled by over overprotective mother, who wants nothing more than for Georgia to move back to their small town, and marry her ex-boyfriend, who just ended their four year relationship. Georgia wrestles with these issues throughout most of the novel, but through these struggles comes growth, and she starts to discover a different side of herself, a side that wants to be happy with her life and make her own choices. And she discovers all this with the help of Logan. The highlight of the story for me would have to be Logan. I knew I was going to love him, because if he’s any relation to Reese at all, who wouldn’t love him? But… Oh my, Logan is oh-so-swoonworthy, and that’s totally not what I expected from him when I started reading the book. We’d met him previous in the series, and with the impression that I got of him in the previous books, I kind of expected him to be a certain way. Boy did he prove me wrong. Throughout the novel he struggles with his own issues, and proves himself to be a pretty awesome guy over and over again. I’m slightly in love with Logan at the moment, and I can imagine he will be one of those characters that will stay in my mind for a long time to come. The storyline for the book follows much of the same as the previous books, and I really enjoyed the familiarity of the story. The characters, the setting; it made me remember things that I had read in the previous books, which in turn made me super happy. Like the previous books in this series, I read this book quickly, in just a few hours time. The storyline had me hooked, and I hated the moments when I had to put the book down, even briefly. I should also mention that the tension in this book was thick enough to cut with a knife. This made for a super intense read! Overall; While Foreplay had been my favorite book in this series so far, Jordan totally blew me away with Wild. This book is definitely my favorite of this series. And I enjoyed this series so much; I hate to see it come to an end! I am now a loyal fan of Sophie Jordan’s, and I can’t wait to check out more of her books in the upcoming future. If you’ve not yet check out The Ivy Chronicles series, I highly recommend that you do so! Oh, I loved this one too! I completely agree--Foreplay was amazing, but this one was astounding. Logan and Georgia together was perfection. I couldn't stop reading! <3 Great review! I still don't know how to feel knowing that Reece's little bro is a love interest. I know he's 18 and whatnot...but it's still strange for me. Happy you enjoyed this one as well, I think Foreplay is my favorite at the moment and I can't wait to see if I change my mind!